Refer to “front fork disassembly and assembly” . Inspect the slide bushing and guide bushing for wear or damage. If they are worn or damaged, replace them with new ones. If they are not clean, clean them with a nylon brush and fork oil. 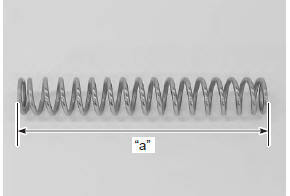 Measure the fork spring free length “a”. If it is shorter than the service limit, replace it with a new one.